Needed to install on upper receiver unless you already have an outside threaded barrel nut such as the SASS. We offer a variety of custom finished including several options as well as an epoxy grit surface. In most cases we will add color and girt for the one upgrade charge. The CFLD is a long handguard designed as a direct replacement of the handguards on some (SASS style) DPMS AR-10 rifles. Lightweight, strong and cool, this handguard brings your rifle into the current era of advanced materials. NO barrel nut or extension is included with the standard model. 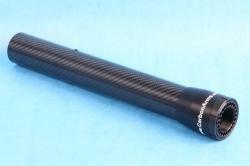 The tube is approximately 16" long and eliminates 1 pound from the SASS configuration! Order with the Carbon Arms barrel nut for use on any standard thread pattern AR-10/SR-25 upper receiver. Customized CF tubes can not be returned if they were produced as ordered! This includes drilling, colors, and grit application. I've been rocking this hand guard for 3 yrs of hard use. Holding up great and looking forward to 3 more yrs.